Q: We are from India. We collect authentic good quality fine art. Contemporary, Masters and National Treasures (India). We were thinking in terms of International art, namely Picasso pertaining to the subject at hand. Would you be wiling to part with the drawing Femme se Coiffant (Woman Arranging Her Hair)? And if yes, what be the price below which you will not sell? We will need to cross check provenance as a matter of routine practice. -Rusi R.
A: [Here I’ll skip ahead a bit.] 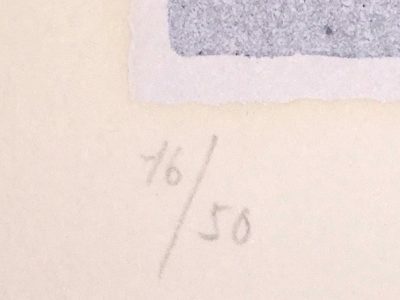 …If this is above your target price range, please note that we have some wonderful Picassos, both drawings and original prints, that are considerably less expensive. Q: This is surely much above our first venture budget in the international field. Do suggest a very good buy, since this is a maiden decision. A: I just tried phoning you unsuccessfully…. I was going to ask you whether you are interested only in paintings and drawings, or if your interest includes original prints. In either case, please note that we have some wonderful Picassos, both drawings and original prints, that are considerably less expensive. It turns out that you inquired about our second most expensive piece…. If you let me know what appeals to you, I would be happy to advise you further. Q: Thanks for the early n warm response. 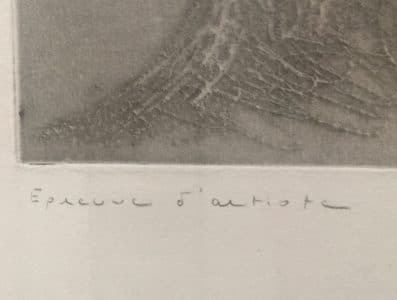 When we finally do decide to go for it, we would like to go for definitely an original drawing in this case, without any doubt of authenticity, and of course we will have to settle for a minor sketch or hopefully a drawing, with signature…. It’s a big leap for us, going from the Indian oils on canvas we collect to sketches. Hence, this will need a further review at the board meeting/s…. A: I understand, and your plan makes sense. Yet, despite the brevity of your message, there is so much to be said in response to it that I hardly know where to start…. I’ll start by addressing the question of authenticity. Actually, here’s a shortcut to my full response on that issue—I happened to have penned a blogpost recently on this very topic entitled “Overdue Diligence”. In addition, we wouldn’t purchase anything if there were any doubt of its authenticity, we fully substantiate its authenticity for you, we issue a lifetime guarantee of authenticity for anything we sell to you, and we accord you the right to return any purchase for any reason or for no reason at all within a reasonable period of time (30 days has been our standard; longer has never been requested but could be negotiated if need be). Our clients, both collectors and other art dealers, have zero doubts about the authenticity of our Picassos or they wouldn’t buy from us….. There is an old Hindi proverb, “The customer is always right.” With that in mind, I would nonetheless like to hike out on a limb and offer an alternate way of looking at collecting art. As I have often said before, I think more like an art collector than as an art dealer, so I appreciate your thoughts and your own approach to collecting. But I would like to share my approach with you, as follows: I do not judge a work of art by its medium, but rather by ten other parameters, which I elaborated in my online guide to collecting Picasso’s original prints (it has relevance to this discussion whether or not you “deign” to acquire a print) and which you could review by perusing the short fourth chapter, entitled “But Some are More Equal Than Others”. Sure, it’s nice to have canvases in your collection—oil and acrylic have a center punch which to some extent drawings and prints lack. I understand you. But in my opinion, so many of Picasso’s works on paper are such breathtaking masterpieces as to compel reconsideration, even on the part of a strictly canvas collector. As for original prints, I go into this subject in greater detail in the print collecting guide, but suffice it to say the following here: Picasso is the widely acknowledged master printmaker of the twentieth century; many of his prints are major accomplishments, are unutterably beautiful, are the result of unique, innovative techniques, and no Picasso collection is complete without them as they are not duplicative or repetitive of his unique artworks. Picasso created his many original prints with his own hands, and they are every bit as original as, say, his bronzes, which he also created by hand but which, like prints, were usually editioned in multiples. Would you not buy a Picasso bronze because there are others just like it? Moving on…when it comes to Picasso, the distinction between drawings and sketches is rather blurry. Unlike my Old-World father, who rated the quality of cut crystal by how many cuts it had, the amount of time Picasso invested a given artwork does not enter into the calculation of many Picasso lovers, myself included, of how great or how valuable it is. In fact, many collectors, myself again included, value Picasso’s economy of line, considering it a major aspect of his mastery. May I gently point out that the brush and ink about which you initially inquired, Femme se Coiffant, despite being a very accomplished, large work on paper, is rather “sketchy”, wouldn’t you say, if you define sketchy by with how few lines comprise the art or how short a time it took the artist to whip it out. Picasso was well-known to be a lighting-fast artist, so I’m guessing a minute, or two minutes tops. Is it therefore any less valuable? Given your interest in the Femme se Coiffant, I suspect you’re already convinced on this score, and therefore entertain the possibility that you’ll soften on the other issues as well. Regarding our other drawings, now that you have provided a hint as to your budget’s ceiling, and given that you require a signature, I could recommend two of our signed but lower-priced drawings, FEMME DE PROFIL and TÊTE D’HOMME [AU NEZ CASSÉ]. In case they, too, exceed your budget, I would be happy to provide some lower-priced alternatives, as we receive a steady stream of offers from folks who want to sell their Picassos. Most are overpriced, but one currently available drawing is not, a lovely portrait of Balzac, reminiscent of Rodin’s bronzes but with Picasso’s distinctive touch. I’ll send photos and a description your way if you’re curious. Q: What a reply that was 👌. One cannot be so effective and yet smooth, without being meditative by nature. Will read it again and do my research, which is blatantly lacking. Was carried away with the word ‘Picasso’ and hurriedly started enquiring, without any research. Now I have the basis. Didn’t know of prints being unique! Re authenticity…my approach of rechecking was objective. I am ignorant of ur standing in the field, and meant no offense. I know u haven’t taken it the wrong way. So, thanks again … and I should revert back when we are ready with regard to the direction. A: No offense taken whatsoever—you should be very wary about authenticity, as copies and fakes are abundant. And it is my job to fully explain why anything of ours in which you’re interested is authentic, and to provide sufficient evidence for this claim. I think I understand what you mean by “Didn’t know of prints being unique!” Perhaps I need to elaborate upon the distinction between the terms “original” and “unique”. Though some of Picasso’s original prints are unique (we have one that is unique in a sense, that is, it is uniquely printed in deep red and uniquely signed in turquoise pencil but which is accompanied by a regular edition of 200; most of the completely unique prints are in the Paris Picasso Museum), the majority of his original prints were editioned in multiple. One more thought for the day: Picasso once said, “I am my sketchbooks,” which statement is rather meaningful. He also once said, in mid-career, “The movement of my thought interests me more than the thought itself.” His sketches, and also the progression of his prints, which he captured by printing their successive states (I more fully define this technical printing term in my print collecting guide, but for a brief pictorial view, check out my blogpost “WHAT’S NOT THERE”), often provide the clearest window to the movement of his thoughts. Many (but far from all) of Picasso’s “sketches” are breathtakingly beautiful, but, to my knowledge, none of them are signed. I know it’s not for you as it is unsigned, but for some insights into his fascinating sketchbooks, perhaps you would find my discussion of the one we own interesting. And we could leave the discussion of your preference for strictly signed pieces for another day….